Job interviews can be challenging, but they're a huge factor in securing a job. With the right attitude and preparation you can walk into any job interview feeling relaxed, capable and confident. 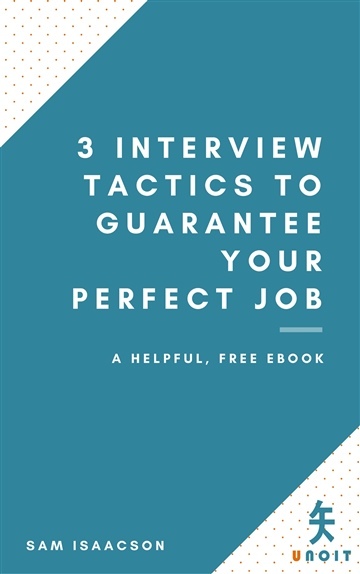 This book gives really grounded tips that you can practice and perfect beforehand, guaranteeing that you'll get a job offer...and spotting the warning signs if this job really isn't for you! Hi, I’m Sam Isaacson. I help people to dream positively about their career, and put steps in place to achieve those dreams. After working with me, my clients have received an average salary increase of 10% - I love helping people find their perfect job and securing it. I'm founder and CEO of Unoit Limited, to help my clients find deeper fulfilment, at a price they can afford.